ISP Class Action Lawsuit: Internet Search Tracking? Improperly Redirecting you to spam advertising web sites? Protecting the privacy of consumers: all Our Law firm Now. Our law firm is investigating whether certain ISPs are redirecting your Internet searches in order to generate income for themselves. A recent study by University of California Researchers found that 12 different Internet Service Providers across the US were apparently Hijacking customers searches. The study found that when users typed in a search engine a word such as “apple” or “bloomingdales” the ISP would redirect the user to websites for Apple or Bloomingdale’s rather than to a page or search results about the keyword typed in. These ISPs work with Paxfire Inc. to allegedly misdirect customers to servers owned and controlled by Paxfire as well as the ISP itself. In some cases they have created "fake" web sites that resemble the real sites; they redirect your searches to spam pages filled with advertising; they may also improperly track you and your searches on the web. 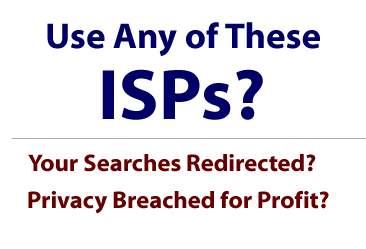 If you use one the ISPs listed below and feel that your privacy or rights have been violated please call our law firm: ask for Bill Kyros at 1-800-934-2921. We are seeking to bring legal claims for users of these internet services. Have you ever typed something into your browser and been redirected to a weird site? Have you ever conducted a search and ended up on a page with a list of paid advertising links run by your ISP? Are you upset about this? Call our attorneys right now 1-800-934-2921. Technical overview: When you type a web address or click on a link, your computer asks the ISP you use for the location of that particular website. The ISP should immediately direct you to the “Internet address,” or IP address of the web site you typed in. What happens instead with unethical ISPs, is that they allegedly use technology provided by Paxfire to give fake redirects to your typed in request to go to certain web sites. The ISPs, in fact, may send you to servers owned and controlled by Paxfire or the ISP. Your internet searches could be improperly intercepted and monitored, with no disclosure or notice! In many cases, internet users are redirected to spam advertising web sites or other commercial web pages that are designed solely to generate profits for the ISPs. If this is done to enough customers the profits to the ISPs can be very large. This type of conduct violates federal privacy laws and violates you contract with the ISP. Are you a victim? Use one of these ISPs? : Cavalier, Charter, Cincinnati Bell, Cogent Communications, DirecPC (HughesNet), Frontier, Insight Broadband, Iowa Telecom, Wide Open West, Paetec, IBBS, Megapath, XO Communications? A lawsuit has been filed against Paxfire and RCN and our law firm is currently investigating the other ISPs. If you use RCN or one of the other ISPs mentioned above and would like more information regarding this case or the ongoing investigation, please fill out the form below or call please call Attorney Bill Kyros at 1-800-934-2921 to discuss your rights. .
ISP Invasion of Privacy? Redirected Searches?